A couple months back I reviewed the Andrea skirt from Collectif, a faux fur trimmed pencil skirt that was designed to be a part of a skirt suit set alongside the Deana jacket. I loved the Andrea skirt and badly wanted the Deana to wear with her, but I didn’t have the money to spend the £110 to complete the suit. Knowing Collectif run a 50% off sale after Christmas each year, I hoped ardently that the Deana would be in stock at the time so I could make her mine. My hopes were dashed when she went out of stock long before the sale was even rumoured to start, so I bought a couple of other items in the sale instead and inwardly moped about the perfect suit set that was never to be, because I am way too emotionally invested in my closet. But then, it happened! At 7.05am of the last morning on the sale, when there were just under 2.5hours left of the sale, I received an email saying the Deana had been restocked. I ordered that baby so fast my Paypal could barely keep up! Days later, when the new up to 75% off sale begun, the Deana was included in that as well at the same half off price of £55. So just in case there are any of you ladies out there who have shared my yearning for this jacket but have some qualms with parting with your money, I decided it was time for a review to help you decide whether or not to buy. The faux fur trim on this jacket is detachable, which gives it a level of versatility that I really appreciate. Saying that, since I don’t have an office job and it’s been freezing here in the UK lately, I have no plans to remove that fur trim anytime soon as it’s joyously warm. Paired with the Andrea skirt, this makes such a warm and cosy suit that I’ve happily worn it out running errands with only underwear and stockings underneath at -3c and only felt a little nippy on my legs. Since it is a jacket, though, made to be worn in the same way you would a coat, there is room enough for you to layer vests or tops underneath easily, which I would probably suggest you do as I’m somewhat sensitive to the texture of some materials and I noticed a couple times that this jacket felt a bit itchy against my torso and arms with nothing worn underneath, even though it’s lined. I ordered mine in a size 14 and I would say it runs pretty true to size as a jacket, as jackets are always cut bigger than a dress or top so that there’s room to wear them over other clothes. This jacket flat measures at 36 inches in the waist, stretching to 38 inches, which explains why my 40 inch bust and a 34 inch waist fit this without any squeezing at all. I can button the jacket comfortably and have good ease of movement in my arms and across my shoulders, which is an area where I often feel restricted in other coats and jackets. If you want a truly snug fit you could possibly size down on this jacket, but you’ll need to consider first your arms and shoulders for the movement you might need while wearing this piece, as well as your own comfort requirements. 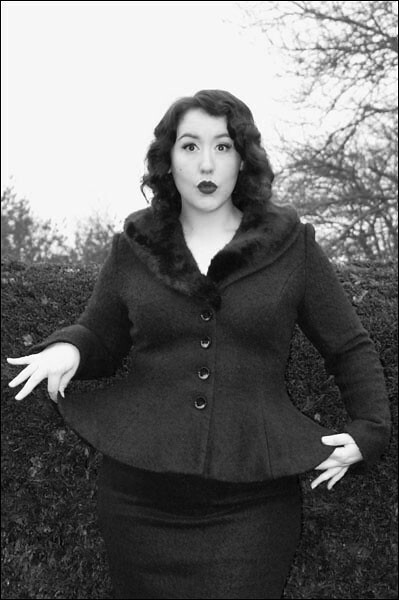 As mentioned, the Deana jacket is still half off in the Collectif sale costing £55, with the Andrea skirt also half price at £32.50, which means you can pick up this complete suit set for £87.50 total compared to the original £175 for the set. Not only is that an incredible saving, but it’s also just a brilliant price for such a quality, warm suit you can bring out winter after winter. 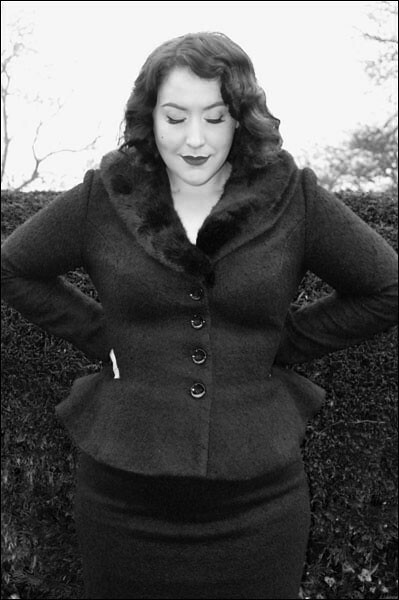 Thank you Collectif, for fulfilling my winter suit dreams! This entry was posted in Clothing Reviews and tagged chic, collectif, pinup, retro, Skirt suit, vintage inspired by missamymay. Bookmark the permalink. Aaaah, I’ve looked at this so many times. I love the truly vintage feel of it…I’m just not sure in my life, I’ll ever need a fur trimmed pencil skirt, which is a pity. I love the two together, I much prefer this jacket shape to the Marianne skirt suit, which I have in green. I found that a little boxy, I love the nipped in waist on this one instead. Good to hear about the arms, I get really frustrated with clothing that restricts arm movement or ‘lifts’ when you move your arms. I’ll keep an eye on it in my size! think it looks awesome on you. Lovely! When I’m off my buying ban….I’m going to need to fill my closet with more Collectif. Oh, I wish we got the weather here to make this suit set necessary! Truly amazing…the outfit…and you are stunning! The photos….well what can I say…well done and full of film noir glamour! I hope you get this message: I have a technical question about the jacket – on the site, it says Dry Clean Only. I have purchased clothes in the past that were labeled such, and some I successfully washed by hand or in cold gentle cycle in the machine, and others I ruined attempting to. I wonder if you ever attempted to wash it, and if so what category this jacket falls into? I called Collectif to ask about the Agnes jacket – that looks like a lighter weight option of the same design – and they cautioned me Agnes won’t survive a wash. …Ummm, what’s a gal to do? I’ve only worn this jacket a couple of times so I haven’t needed to clean it yet. If it says dry clean only then the best thing you can do it just to dry clean it.